Thank you for the comments on my winter coat post. I thought I should give you an update about it. Here is a picture of a quick 'n dirty muslin for the 'barrel'-coat. I decided to try that one first, as it would be the most practical, and I came up with a bit of a plan to use the black fabric for a coat for my boyfriend as well (I've got 4 m, but the New Look coat might just use up all of that). The weather is unusually warm for the time of year, so I haven't had any real need for my winter coat so far. I should confess here and now that I'm completely obsessed with making my own patterns. Someone pointed out a rather wonderful vintage reproduction Vogue pattern which could be used for a coat like this, but to be honest, I was never really going to use that... The last two patterns I bought (vintage reproduction Vogue dresses) are still unused on the shelf. I have opened the envelopes and studied the pieces and the fabric lay-out in order to understand their construction. Ever since I learned to make my own patterns three years ago, when take a course with the wonderfully talented M, I have been hooked. In my opinion, nothing can beat the fit of a garment made from you very own basic sloper. So, I made the pattern for this coat. This is actually the second muslin, I made an earlier one just for the body and sleeve shape, but thought it needed yet more room in the chest to really get the loose barrel-shape effect. I decided this would be a great opportunity to try out the square set-in sleeve which I have been looking at in my pattern-making books before. 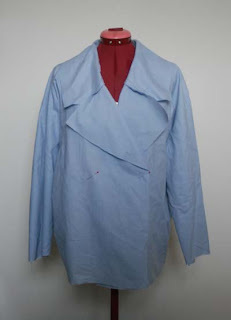 The coat is double breasted and has a large notched collar (it will be smaller than it looks now, I made only half of it in the muslin and left the seam allowances on).